Remington Hawthorne, Earl of Latham, has spent his life protecting the Crown. When he’s assigned to play the part of lover to Emma Masterson, one of the few female spies in England and the one woman he can’t forget, he’ll have to risk his heart as well as his life. It isn’t easy being an independent woman, much less a spy. Perpetually tasked with proving she is as valuable as any man in her profession, the last thing Emma needs is to be reunited with the one man who makes her want to forget her duties and get lost in passion. 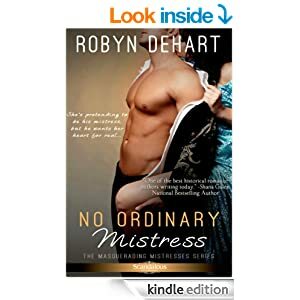 NO ORDINARY MISTRESS by Robyn DeHart is an exciting Novella, Regency Historical Romance set in 1812-1814 Paris and England. #1 in “A Masquerading Mistresses”. This is the tale of Remington Hawthorne, Earl of Latham and Emma Masterson, both spies, both passionate and both in for a few surprises. Filled with spies, danger, passion and romance. A quick read that will have you turning pages. A great start to a new series! With engaging characters and an intriguing storyline, I look forward to the next in this soon to be intriguing series, “Masquerading Mistresses”. Well done!